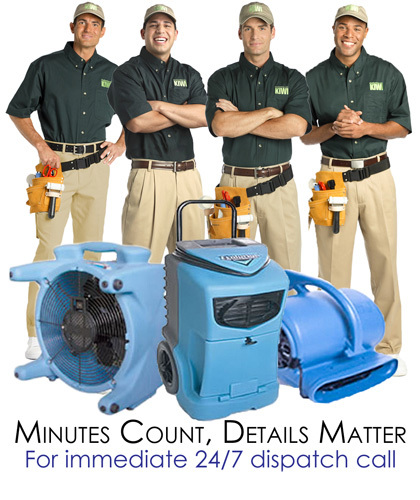 Seagoville Water Damage Repair Teams are Ready at a Moment’s Notice! Our Seagoville water damage repair teams know that severe storms are a fact of life in the Lone Star State. Flooding and mudslides can happen in an instant, with little or no warning. Tornados can miss your house and still dump thousands of gallons of water and mud in your living room. That’s why our Seagoville water extraction teams are standing by to help remove that water from your home when you need it most. Rivers and lakes can rise several feet in just under a half an hour. In addition, there are those pipes that tend to bust when you’re not at home, drenching your carpets. When those types of emergencies happen, Seagoville’s Emergency Water Damage Hotlines are always answered, and our Emergency Water Damage Repair Teams from KIWI are always standing by for immediate response, 24 hours a day, 7 days a week, including holidays. When it comes to quickly removing water from your home, our Seagoville water extraction team knows that you can’t wait too long! Temporary storage of your personal belongings, including pick up and delivery. When disaster happens, every minute counts. You want a response team you can trust. KIWI has been helping people for 30 years with a superb record of quality service and customer satisfaction. Call us anytime.our operators are standing by. You’ll be using the best water damage repairing services in Seagoville, Texas!